Can we talk about how awesome Darwin is? My birthday present to myself in May was one last trip in Australia. I used my Qantas points to get a free flight to Darwin and booked a day tour to Kakadu National Park to see Aboriginal rock art at Nourlangie and crocodiles in Yellow Water Billabong. Darwin itself is a nice tropical destination and most of the attractions are walkable. Be sure to visit in the dry season though (May to September are probably best). The temperature was perfect for me and I am always cold! Eavesdropping on foreign tourists and guessing which language they are speaking is always fun when travelling. Coming across multilingual signs is an added bonus. The day trip to Kakadu was very long and expensive, but worth it. We saw quite a few crocs at Yellow Water. We ended the trip at Mindil Beach for the beautiful sunset. We stayed at The Cav near the bus depot and information centre, and used Darwin Airport Shuttle for transfers to/from the airport. You can see a few more photos on Instagram and I’ve uploaded a video of a crocodile and the Mindil Beach sunset to YouTube. The next time I come back to Australia, I will definitely visit Darwin again! This entry was posted in Australia, Travelling and tagged australia, darwin, kakadu, northern territory, outback, top end, travel, vacation on June 22, 2015 by Dr. Jennifer Wagner. It doesn’t seem like it’s been nearly 4 years since I left France for Australia, but it has. And now it’s time to say goodbye to Australia, unfortunately. My student visa expires soon and I haven’t been able to find a permanent job (most likely because I do not yet have my PhD “in hand” as almost every job listing specifies). Even though Australia now has a Post-Study Work Visa for recent graduates, I am not eligible since I started my program before November 2011 and there is no alternative option for me. I am slightly bitter about how unfair immigration laws really are and being forced to leave a place I love, but I will continue to apply for jobs in Australia with the hope of returning someday. I am also looking for jobs in North America and Europe, so if you hear of any French or applied linguistics lecturer positions, please let me know. I’ll be back in Michigan and Virginia for a short time in June to see family, and then I’m off to Europe for a few weeks for the New Zealand Studies Association conference and my annual trip with Michelle. We’ll be exploring Eastern Europe and Iceland, and then I’ll be heading to France and Benelux to visit friends and family. When I return to the US in August, I’ll be able to work full-time on the website since I won’t have a job so expect more authentic language videos and realia to be uploaded then. If anyone in the Adelaide area needs furniture or household items, I’m selling almost everything I own on Gumtree and Ebay. (I’ll be adding my desktop computer and car soon.) I’ll also be donating some things, such as books and kitchen items, to Salvos if you like free stuff. I leave Australia June 14, but don’t worry, Charlie is definitely coming to the US with me. He actually arrives before I do! Jetpets will be taking care of him along the way, and he even gets to spend the night in both Sydney and Los Angeles on his way to Detroit. My handsome little man, and soon to be world traveler! This entry was posted in Australia, Michigan, Travelling and tagged australia, immigrant, immigration, nomad, north america, phd on May 28, 2015 by Dr. Jennifer Wagner. I was in Brisbane all last week for the AILA 2014 World Congress, the largest conference for applied linguistics in the world. It is held every three years and I had just missed out on the Beijing conference in 2011 by one month when I first started my PhD. I presented my research on stylistic and geographic variation in French textbooks and was pleasantly surprised at how many people were interested in my presentation. The conference was quite large – over 1,600 delegates – and exhausting but definitely worth it. The program was over 200 pages, not including the abstracts, and there were about 25 parallel sessions to choose from. I found all of the plenaries interesting and was overall impressed by how well run everything was. I can’t imagine organising a conference of this size is an easy task. You can check out the program and abstracts via the website to see the diversity of presentations and symposia. It can be a bit overwhelming reading through it all – now imagine having to choose only one session among all of them. Tough decisions! I tended to stick to the strands on language teaching, learning and educational technology. I even found myself in a talk that reported on a Māori teaching course, which I wasn’t expecting from the title since it didn’t mention any specific languages. Hearing Māori – and let’s be honest, incredibly adorable New Zealand accents – is always nice! My favorite presentation was by Tom Cobb since it’s very relevant to my research. He has recently been adopting English-based corpus tools to French, which also helps improve his amazing Compleat Lexical Tutor website. The next AILA World Congress will be held in August 2017 in Rio de Janeiro, Brazil! See you in South America, my fellow applied linguists! This entry was posted in Australia, PhD Research and tagged aila, aila world congress, applied linguistics, australia, brisbane, conference, international applied linguistics, queensland on August 20, 2014 by Dr. Jennifer Wagner. I flew up to Gold Coast last Wednesday to meet up with one of my oldest friends from Michigan. Jessica just finished her postdoc in Melbourne and is moving back to the US tomorrow, so this was our last trip together in Australia. Most people head to the GC either for the beaches or the theme parks. We did spend some time on the beach, but we actually spent most of the time playing with cute Australian animals at Currumbin Wildlife Sanctuary. Of the various districts in the Gold Coast, Surfers Paradise is probably the most well-known and popular. I definitely heard a lot of foreign languages (mostly French!) spoken there. The tallest building in Australia, Q1, is also in Surfers Paradise. You can go up to the Skypoint observation deck (though it’s rather expensive) or even climb around outside. We also rented a car for the day and drove down to Byron Bay in New South Wales, where the most easterly point of the Australian mainland is. Gold Coast is a great tourist destination since the airport is quite small (and resembles a food court more than an airport) and public transportation to and from the airport is incredibly easy to figure out. Bus 702 serves the airport every half hour and heads up the Gold Coast Highway. If you buy a go card from the shuttle desk in the airport (for $5) and add money to it, you will save a lot. The rest of my travel photos are in the Gold Coast album at the Gallery. This entry was posted in Australia, Travelling and tagged australia, byron bay, gold coast, queensland, travel on April 30, 2013 by Dr. Jennifer Wagner. Kangaroo Island is Australia’s third-largest island and definitely worth a visit for the beautiful beaches and adorable wildlife. Although I’ve been to many beaches in Australia already, every new one I see is just as gorgeous as the last one. KI did not disappoint. Sadly, I did not see any (live) kangaroos on the island, but I did see plenty of sea lions, wallabies, echidnas, goannas and koalas. My friend and I drove down for the weekend (it’s only a 1.5 hour drive from Adelaide, plus a 45 minute ferry) so we weren’t able to visit all of the towns and attractions. We mostly did the southern coast along the highway (the only paved road) since riding in my little car probably wouldn’t have been too comfortable in the north, where almost all of the roads are gravel. The major tourist attractions are mostly along the southern coast too. You can also fly to Kingscote from Adelaide and rent a car (there are no taxis or public transportation on the island) instead of driving. There are some bus tours that depart from Adelaide but the one day tour sounds extremely exhausting, so I would highly recommend driving and staying for a few nights. Just try not to drive after dark when the animals come out! Check out the Kangaroo Island album in the Gallery for more photos. 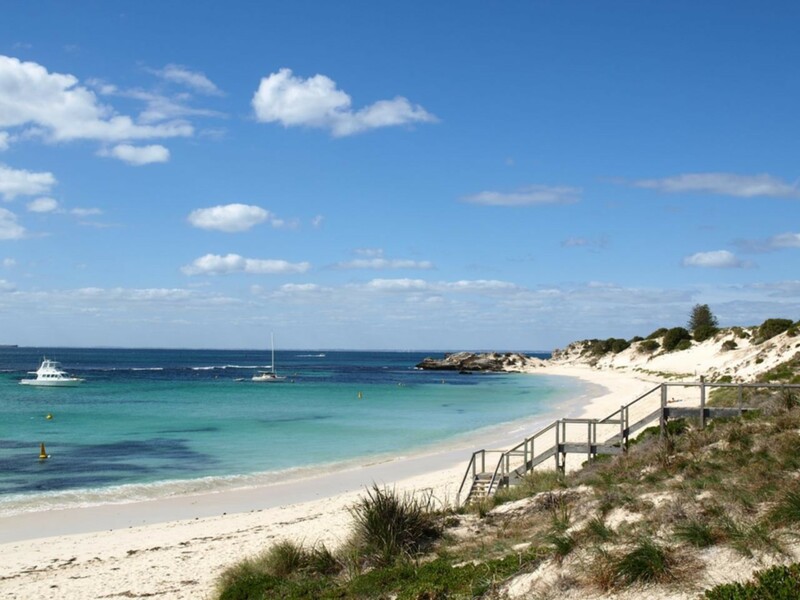 This entry was posted in Australia, Travelling and tagged adelaide, australia, kangaroo island, south australia, travel on February 1, 2013 by Dr. Jennifer Wagner. I recently returned from two weeks of travelling around Australia. A friend from Arizona, Michelle, came to Australia for the first time and we decided to visit all of the major tourist attractions. We went to Sydney and Melbourne, drove along the Great Ocean Road, enjoyed a few days at the Great Barrier Reef and Whitehaven Beach, and finished at Ayers Rock Resort. Michelle also came back to Adelaide with me and we went to Cleland Wildlife Park so she could hold a koala (one of the few places in Australia where you can do that) and up to the Barossa Valley for a wine tour. Because of the large distances between all of these places, we had to fly everywhere but since flying in Australia is the opposite of flying in the US (i.e. it is actually a pleasant experience), we had no problems with our flights or baggage. I met Michelle in Melbourne where I had rented a car so we (ok, I since Michelle had never driven on the left before) could drive along the Great Ocean Road. We actually did it in one day, which turned out to be nine hours of driving for me, but we made so many stops along the way that I was not tired at all. Plus the drive is incredibly beautiful and I was so excited to finally be doing it. We also wandered around Melbourne in 100° heat (38°C) and watched the Penguin Parade on Phillip Island. Then it was off to Airlie Beach where we did the Great Barrier Reef and Whitehaven Beach tours with Cruise Whitsundays. I managed to not get sick on the boats, but even if you are prone to motion sickness, they are totally worth it! The last destination was, of course, Ayers Rock – or Uluru, as it is called by the traditional owners of the land, the Anangu people. There are also other rocks in the national park, called The Olgas or Kata Tjuta, which are just as beautiful. A three day pass to the Uluru-Kata Tjuta National Park only costs $25, but getting there and the price of accommodation can be a bit high. We flew to the Ayers Rock airport instead of Alice Springs (“only” a five hour drive away) because we were staying at the Ayers Rock Resort next to the national park, which is the only place to stay since there is no camping inside the park. It is essentially its own little town, with a gas station, grocery store, post office, police station, etc. but what I loved most was hearing so many languages. Since Ayers Rock is the biggest tourist destination after Sydney and the Great Barrier Reef, there are more foreign tourists there than Australians. Australia is very multilingual and I often hear several languages in the big cities and even when I’m out shopping in the suburbs of Adelaide, but languages were everywhere at Ayers Rock! In addition to the wonderful dry heat of the desert (anything less than 95°F / 35° C and I’m chilly), it was paradise for me. I’ve uploaded some videos of Ayers Rock, the Great Barrier Reef and Australian animals to my Youtube channel. This entry was posted in Australia, Travelling and tagged australia, ayers rock, great barrier reef, great ocean road, holiday, melbourne, sydney, uluru, vacation on December 19, 2012 by Dr. Jennifer Wagner. I fly to Perth, Western Australia, tomorrow to present at the Teachers of French Association Conference. My presentation on the vocabulary coverage of French textbooks will include the beginning stages of my PhD project. I will report back on all of the presentations and everything new I learn about teaching and learning French in Australia next week. Then thanks to the Easter holiday, I have a few days to explore the Perth region, including Fremantle and Rottnest Island. La vie est belle, n’est-ce pas ? This entry was posted in PhD Research, Travelling and tagged australia, french conference, perth, teachers of french on March 31, 2012 by Dr. Jennifer Wagner.